Belfast 1981, a hostile environment where fighting on the streets and an intimidating military presence is commonplace, and during a political climate where young prisoners are starving themselves to death in protest, meanwhile all that the girls in The Dalebrook Torpedoes FC can think about is winning their next game. This isn’t the first theatrical foray into football that The Lass O’Gowrie has done. Jack Rosenthal’s The Best premiered to critical acclaim earlier this year. Although Meanwhile might at first glance seem like a natural successor to The Best, it is a much different beast, but many of the same creative team and cast have reunited to bring us this tale of a girls football team during the Troubles. Colin Connor’s story is one that weaves recent history alongside the struggle of the Dalebrook Torpedoes as they aim to beat the Bad Boys. It is an admirable exploration of the politics of outsiders who yearn for integration contrasted against how childhood innocence can be brutally taken away in a heartbeat – or a bullet. Connor’s success in interlinking these threads in such an entertaining way is to be applauded. Central to the plot is Richard Patterson’s portrayal of The Young Man. His powerful monologues regularly punctuate the action as his weight drops due to his hunger strike. A casualty of the ongoing war between the “opposed Irish people” and the British, he is part of the movement against what Republican prisoners viewed as the ‘criminalisation’ of their treatment. It is a harrowing portrayal that gets more and more fragile as the play goes on, with the performance and writing uniting in a eye-opening look at something in such recent history. I’m aware of the Troubles – who isn’t? But I wasn’t aware of Bobby Sands’ story, and I suppose I am naive to the danger and rioting that was a regular feature for the families in Meanwhile. It is a captivatingly uneasy look at this troubled period in history. Once again, a piece of fringe theatre has taught me about a slice of the past that leaves me wanting to know more. Everyone gets to play multiple roles which demonstrates the remarkable versatility of the actors concerned. Indeed, it is hard to single anybody out, as they are so good as a unit. The girls especially have great chemistry with each other, notably the rivalry between Amy Gavin’s Dobby and Hannah Ellis’s Dervla which is entertainingly bitchy. You can believe in the Dalebrook Torpedoes, not only as a team, but also in their innocence and naivety. The girls naivety is endearing with their talk of secret codes and referring to themselves as the ‘pedeos’. But, because we’re let into their homes and their loves, we get a picture of their fractured lives and families. From Gary Hanks overbearing cocky gangster figure through to Lisa Connor’s hilariously bolshy Foxy, there is a genuine sense of community here. It is a more credible community spirit created in the hour here than in most soaps now. It would almost feel cosy were it not for a scene of brutal violence that punctuates the story half way through. Sharp and shocking, and creatively handled by Director Nick Birchall, it serves as a reminder of the danger of the streets in Belfast. The concluding and pivotal match is a highlight of the play, the slow motion action an inspired choice. Mark Simpson’s original score marks many of the play’s moments, uplifting and harrowing in equal measure. Once again, the bar has been set high. Already a multiple sell-out, Meanwhile is challenging, definitely thought provoking, touching, but above all, uplifting. 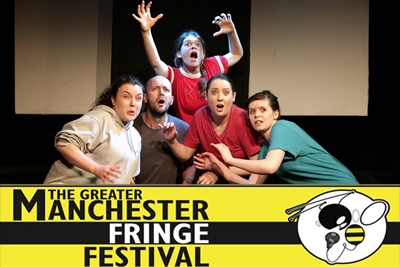 If the rest of the Fringe is as good, Manchester is in for an outstanding month. Meanwhile continues at the Lass O’Gowrie until Thursday 4 July. It will then move to the Bolton Octagon on 13-14 September. Photography by Shay Rowan.